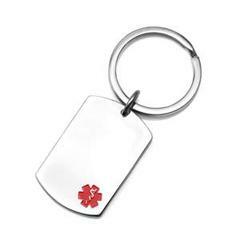 Our stainless sel dog tag style medical id alert key chain measures 1 x 1 1/2 inches and can be custom engraved on both front and back. Medical Key chains are a perfect alternative to to wearing medical jewelry. They are even great to attach to your childs back pack, book bag and more to keep them safe while away from home. Free black laser engraving up to 6 lines on front and 8 on the back!